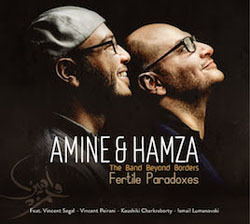 On Fertile Paradoxes, Tunisian brothers Amine M'raihi (oud) and Hamza M'raihi (kanun) combine artistries with violinist Baiju Bhatt, saxophonist Valentin Conus, percussionists Prabhu Edouard and Fredrik Gille, and special guests besides. It's an aptly named album, as these musicians mix seemingly disparate genres, spirits, and geographic moods into an integrated whole. The commonality that binds them is an implicit understanding of not only where they've come from, but also where they're going. The ability of this ensemble to craft splendid sonic dishes from minimal ingredients finds synchronicity in Amine & Hamza's composing. Case in point is opener “Spleen,” which over its nearly 11-minute course showcases a melodic array of flavors. Whereas the coleaders evoke desert and arid climate as a lens into childhood pasts, Conus's tenor saxophone lends a futuristic urbanity. Indian classical vocalist Kaushiki Chakraborty (indelibly present also in the otherwise fleeting atmospheres of “Café Tunis”) adds depth of texture and widens the album's emotional reach even further. Between this and the scintillating farewell of “Frozen Rivers,” strengths of intuition abound. “Love is an Eternal Journey” is especially remarkable for its insight into the duo's interactive grammar. Oud and kanun work in tandem—as outer and inner voice, respectively—of an entity traveling the globe in search of universal impulses, while Bhatt's violin traces every moment of its shadow. Like many tunes that follow, such as the initially melancholy “Brahim's Dream” and the introspective “Letter to God,” it builds to an invigorating finish and hits the ground running the moment it finds its feet. The former's appearance by clarinetist Ismail Lumanovski makes it a highlight. Tenderer moments abound in “Lullaby for Leo” and “The Quest,” both of which carry their weight in beauty.